Developed by Grandmaster Lam Yiu Gwai, Dragon style kung fu (long ying kuen) is the only Chinese martial arts system that is modelled on a mythical animal. While other styles developed that imitated the movements of animals, birds and insects, Dragon style was developed from the understanding, essence and symbolism that these awesome and immensely powerful creatures represented. Dragon style is an extremely effective martial art, incorporating a wide variety of kicks, sweeps, strikes, locks and takedowns. However, concealed within its practical and efficient external form is a devastating ‘internal’ power – an explosive force that also generates sensitivity, speed and agility. The roots of Dragon style kung fu can be traced to the Haushoutai temple on Loufwushan mountain…. The Chinese saw dragons as life-giving beings that circled the heavens and which possessed a god-like quality that was worthy of reverence and worship. During the Celestial Empire it was the emblem for the Imperial family, with the “Son of Heaven” often referred to as the “Dragon King”. Dragons also symbolised earth and water, and was the sagacious protector of the land despite the fact that they also represented the terrible destructive power of nature. Above all, the dragon represented the fertilising power of rain. As the continuous pelts of rain may nourish growth and health on one hand, they may also bring devastation on the other – as with the movements inside Dragon style kung fu. The Ch’an Buddhists at the Shaolin Monastery understood dragons to be far more than the bringers of rain or the sign or royalty. They believed them to be a cosmic manifestation that signified the momentary, elusive vision of enlightened Truth which is eventually and suddenly realised by a Ch’an master. To the Taoists, the dragon epitomised the Tao itself, an all-consuming force that may suddenly reveal itself to us only to instantly disappear again into the ethos. The roots of Dragon style kung fu (‘long ying’ or ‘lung ying’ in Chinese) can be traced to the Haushoutai temple on Loufwushan mountain. Dragon style was taught to its monks within the temple to enhance their superior fighting skills, spirit and internal development. One of these Teachers was a monk who was known as Hai-Fung (after the place where he was from) and also as Gao Xiong-Wen, (meaning Upright River). Another monk, Da Yu (also known as Tai Yuk), also came from the southern temple and was proficient in boxing skills. Another teacher at the temple was a Taoist called Wong Lee Kiu. A man named Lam Qing Yuen from the Potau-Cun, Bolou county of Guangdong had learned kung fu from these monks, as well as from the abbot Guang Jin of Shaoshu Mountain’s Shaolin Temple (Fujian province). Later on in life, he was directed to the Taoist monastery at Haushoutai of Mountain Loufwushan by the head of the Yuen Miu Taoist Temple in Huezhou via a letter. There, he was defeated in friendly combat by a student of the abbot Da Yu and seeing how he still had much to understand, requested to learn under Da Yu’s instruction. His son, Lam Yiu Gwai (1876 – 1966) started to learn kung-fu at a very young age from his father and grandfather. He progressed quickly, and in his early teens was able to beat grown men. He thought himself quite accomplished, however his father worried that his physical ability had grown faster than his emotional refinement and would lead to trouble. At the age of sixteen, he started his own school in Dongjiang and taught as well as learnt from various masters. Unfortunately, his masters passed away before he had completed his training. Later, he started to teach students from a village below Loufwushan and at the request of the local villagers, he agreed to do a performance in front of the local temple. Coincidentally, a student of the abbot Da Yu happened to be there. Seeing that their style of kung fu was similar, he invited Lam Yiu Kwai to come back to Haushoutai to learn from Da Yu. Remembering that his father also learnt his skills from Haushoutai, he decided to follow the abbot’s teachings. When he arrived, an abbot named Gao Xiong-Wen was impressed by his desire to learn and better himself. He decided to test Lam Yiu Gwai by making him demonstrate his skills in friendly combat with some other students. Initially, he defeated a student called Ma Chen-Jie, but when Gao Xiong-Wen tested him personally Lam Yiu Gwai was unable to defend against the abbot’s superior skills. Seeing that he was no match for the abbot, Lam Yiu Gwai asked how he was able to beat him so easily. Gao Xiong-Wen and Da Yu were touched by his sincerity and agreed to take him as a student and teach him the secrets of the techniques of Hauquan-Xiaoma of Dragon style. As a student of Haushoutai, he often went up to the mountains with his master as a means to gather herbs, study their characteristics and learn Chinese physiotherapy. Over time, he also became a master in this field. When Lam Yiu Gwai returned to his village, he had integrated all he learned and was able to demonstrate Dragon style kung fu to a very high level. He began teaching, married and had several children. In the early 1920’s, Lam Yiu Gwai went to the city of Guangzhou where he had heard there was a need for martial arts teachers. He established a number of Dragon style martial arts schools with several senior students to assist him (Ma Chai, Lam Woong Gong (his son), and Tsoi Yiu Cheung). In 1947, a martial arts tournament was held in Guangzhou. A local newspaper had an extract dedicated to Lam Yiu Gwai’s background and gave him the nickname of “Dongjiang -laohu” (The Tiger of Dongjiang). However, Lam Yiu Gwai was not a man who enjoyed fighting, but in order to gain a higher level of martial arts he was willing to participate in friendly sparring. It was just that there was no one who could beat him! The most famous of the Guangzhou teachers at that time were Lin Yum Tong (Mo-gar style), Lam Yiu Gwai (Dragon style) and Cheung Li Chen (Bak-Mei style). Lin Yum Tong introduced Lam Yiu Gwai to General Lee Yum-Chu who hired him as the head martial arts teacher to soldiers in the army. In time, out of respect for the incredible ability these three teachers, they known as the “Three Tigers of the East River”. Lam Yiu Gwai continued to teach and died in 1966 at the age of 90. Lam Yiu Gwai is seen as the grandmaster of southern Dragon style kung fu. 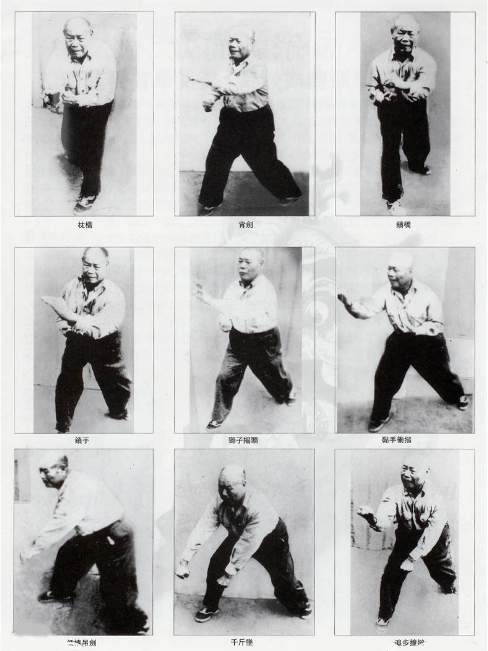 This unique fighting system is comprised of Hakka kuen, (the style of Lam’s grandfather and father) Shaolin, (his teachers from Wah Sa Tsoi) and Taoist forms (from Wong Lee Giu). Lam Yui Gwai kept the forms he learned from his teachers intact, but he also created new sets which blended all the concepts and principles of his studies. Dragon style is a close range fighting style that incorporates a wide variety of highly effective kicks, sweeps and rapid strikes. Concealed within its strong ‘external’ movements is a softer, ‘internal’ force that enables sensitivity, explosive power and agility. When in use, Dragon style embodies the essence of a Chinese dragon so that – when you attack you are like the wind, when you defend you are like a cloud, when you stop you are like iron, you advance like a tiger and retreat like a cat. The strikes in Dragon style are rapid and continuous, controlling the opponent from the moment he moves to attack you. The body must retain a ‘dragon-like’ shape, training the wrists, shoulders, waist as well as other joint areas. Movements are fast and flowing with every strike hitting its intended target, as the practitioner “waits for the attack, sticks onto the attack, deflects the attack and pursues with an attack.” Based on a highly flexible foundation of dynamic footwork, mental and physical sensitivity and powerful strikes, the practitioner has a limitless arsenal at his disposal that can adapt to any situation. As he learns to focus his Chen (mental power) with technique, his mind and intent become one. Dragon style is a complete fighting system that is highly effective and practical. In its practice, Dragon style also helps develop the student mentally, ethically, physically and emotionally, keeping the mind and body young, supple and strong. Focus to learn and condition the body. One must not have any act of laziness. Be righteous and uphold your honour. One must not have any act of hypocrisy. Respect your parents, honour your teacher. One must not have any act of defiance. Treat others with honesty, treat your friends with loyalty. One must not have any act of arrogance.